The other day at lunch, my coworkers and I had a very heated discussion about whether or not brunch was worth the long wait. And when I mean long wait, I MEAN lonnngg wait. There are a couple places around Portland (The Screen Door and Tasty n Sons being the worst offenders) where people actually camp out an hour or two before the restaurant opens just to get through the front door. All in all, we're talking about a two to three hour wait! Grim. With that being said, you've probably figured out that I'm firmly in the camp that brunch is NOT worth the long wait. Because often times, I find that the longer I wait, the less satisfied I am with the food. See my problem is that I tend to just get angrier and angrier as I wait in line (I believe the official term is "hangry"). By the time I get seated, I'm in full-on rant mode, hating everybody and everything around me. And then I get preachy. Because why the hell should anybody have to wait for something you could make in your own kitchen?! In an ideal world, good food would be accessible to everybody! In any case, still. It seems like a 3 hour wait for a weird, made-up meal halfway between breakfast and lunch is the exact antithesis of my belief that good food should be accessible to everybody. Especially when it's so easy to make a great brunch meal at home. I know that traditional brunch fare consists of bacon and eggs, but I like to get my vegetables out of the way early in the day. If you're trying to eat healthy and failing (ehem — me, most of the time. I'm a dessert blogger after all. ), I really recommend this method of eating your vegetables first thing in the morning. Because everything is better after a long night's sleep, vegetables included. 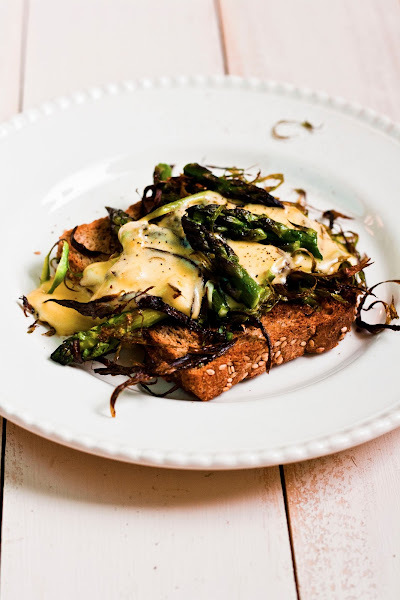 These particular asparagus vegetables are especially delicious because a) it's asparagus season and asparagus this time of year is quite lovely; b) the asparagus is delicately crunchy after having been roasted in olive oil, and c) they're topped with a super buttery and decadent hollandaise sauce. But what do I mean by "delicately crunchy"? You see, shaving the asparagus into long, thin strips, tossing them in salt, pepper, olive oil and roasting them for a few minutes turns them into something else entirely. Because the shaved strips are so thin, the asparagus almosts melts in your mouth. But despite this delicate shaved texture, the roasting process also gives them an unmistakeable crunch that I adore. And when combined with a slice of toasted, hearty whole-grain bread and buttery (seriously, this hollandaise contains nearly a full stick of butter), lemony hollandaise sauce...why on earth would you wait two hours for brunch when you can make a dish like this in less than 15 minutes? Want some protein with your breakfast? No worries! This dish works wonderfully with both bacon and eggs. If you're using bacon, I recommend roasting the shaved asparagus pieces with any leftover bacon fat you have in the pan. If you're going the egg route, I recommend fried or soft-poached eggs with this recipe. If you're doing both bacon AND eggs, let me just say that I admire you and want to shake your hand. Seriously — you're my kind of person. The recipe calls for a pound of asparagus. A pound of asparagus seems like a lot, but after shaved and roasted, the asparagus really shrinks a lot. Traditionally, you prepare asparagus by snapping off the tough ends. You want to hold on to the tough ends for this recipe and use them as a handle when you shave your asparagus. Speaking of shaving the asparagus, I used a vegetable peeler to shave my asparagus stalks. Simply hold the tough end of the asparagus, and shave up the asparagus stalk (away from you) in a fluid motion to create long, thin, asparagus shaved strips. I hear a Y-shaped vegetable peeler works better for this project, as well as a mandolin. But a regular ol' vegetable peeler worked just fine for me, so don't fret. The asparagus will roast for 10 minutes, which is exactly how long the hollandaise sauce will take to make. I suggest prepping your ingredients for the hollandaise sauce beforehand and making it immediately after you pop the asparagus into the oven. That way, everything will be done around the same time and you can eat your meal immediately without anything going cold. Preheat your oven to 400 (F). While the oven is preheating, prepare your asparagus. 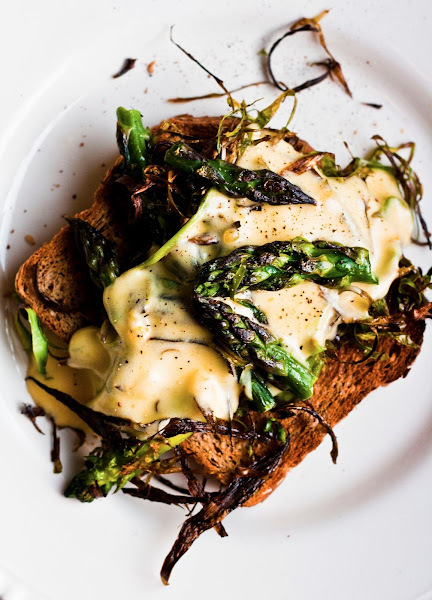 Snap off the heads of all the asparagus stems and set aside. Lay a single asparagus spear on the cutting board and use a vegetable peeler to create long shavings of asparagus by drawing the peeler from the base to the top of the asparagus stalk. As stated in the cook's notes, no need to snap off the tough ends — they will act as your "handles" as you peel the asparagus. Don't worry if the shavings are unevenly thick — this will give your toast a unique texture. Repeat with remaining stalks, and discard the tough ends. Toss the asparagus heads and shavings in 1 1/2 tablespoons olive oil, 1 teaspoon lemon juice, salt and pepper. Roast in the oven for 10 minutes, until some of the thinner shavings have turned crispy and brown. 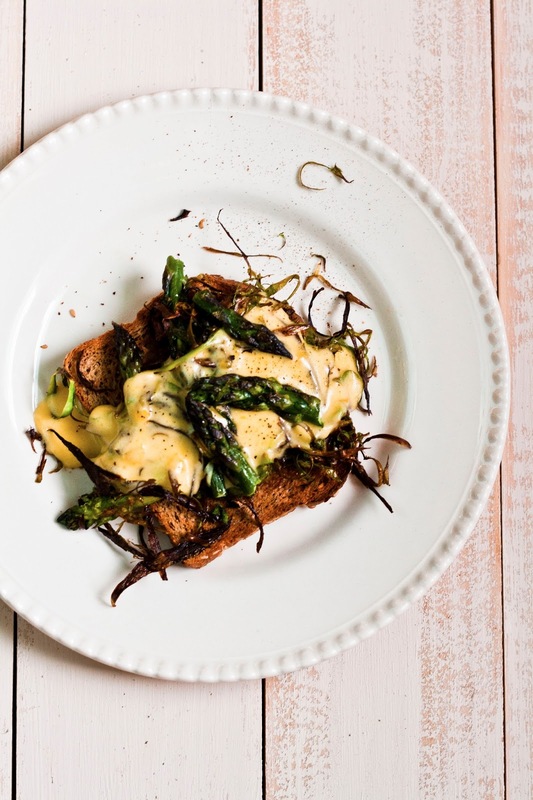 While the asparagus is roasting, make your hollandaise sauce. In a small, heavy-bottomed saucepan, whisk together 4 egg yolks, and 1/8 teaspoon salt. Cook over very low heat, whisking constantly until the mixture is light, foamy, and slightly thickened (about 3 to 5 minutes). If at any point during the process the yolks begin to curdle, immediately remove from heat and continue to whisk for a minute before returning the pan to its heat source. Once the egg and salt mixture has thickened, remove from heat and stir in 6 tablespoons salted butter, two tablespoons at a time. Once the butter is completely incorporated, return mixture to heat sauce and continue to whisk until the mixture is thick and bright yellow. Add 1 teaspoon freshly squeezed lemon juice, whisking it in completely before serving. I'm not sure if I'm yet ready for asparagus for breakfast, but you did inspire me to make it for dinner tonight! Ooo, shaved asparagus! 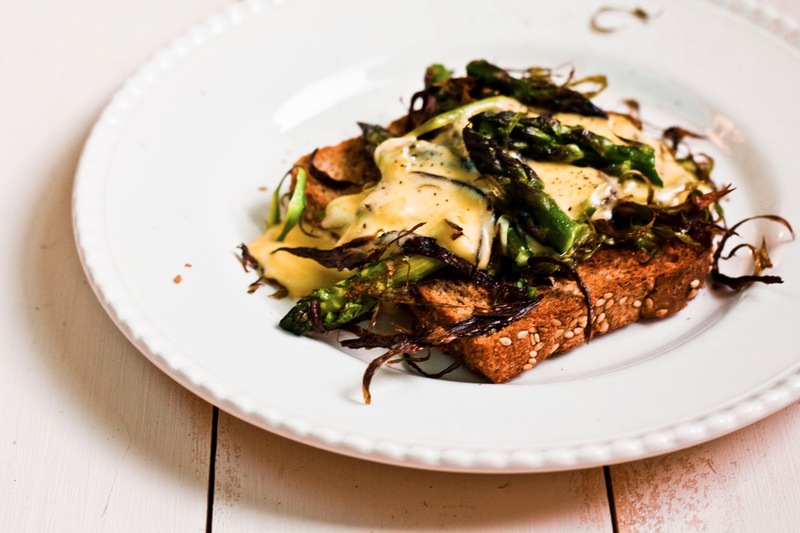 I might pass on the hollandaise sauce (well, we'll see- husband doesn't eat egg so that's a lot just for me), but I am so curious to try melt in your mouth asparagus! I just love everything about this recipe but the cholesterol. Sob!! This is beautiful. What a lovely idea.